The leaders met in the French capital on the sidelines of a global governance forum co-hosted by China and France. Noting the increasing volatility and uncertainty in the international situation with a rising tide of protectionism, Xi said China is willing to work with all parties to firmly uphold multilateralism, improve global governance and jointly address global challenges. China and Europe are two major forces in the world, and are important participants in and constructors of the economic globalization process, Xi said, adding that they share broad common interests. The Chinese president proposed that the two sides join efforts in three aspects. Firstly, they should together uphold multilateralism, Xi said, urging China and Europe to protect the status and authority of the United Nations (UN) and the international system with the UN at its core. China is willing to increase communication and cooperation with Europe within the framework of the UN, and actively strive for more achievements in resolving international disputes by political means, addressing climate change, promoting sustainable development and other fields, Xi said. Secondly, he proposed that China and Europe work to facilitate development and prosperity on the Eurasian continent. China is willing to continue to push forward the alignment of the Belt and Road Initiative and the EU's Euro-Asian connectivity strategy, Xi said, adding that China will promote bilateral as well as third-party market cooperation to realize mutual benefits and win-win results for all parties. Thirdly, China and Europe should improve strategic mutual trust, he said. China has always regarded the EU as a strategic partner of cooperation and supported the EU's solidarity, stability and prosperity, Xi said. 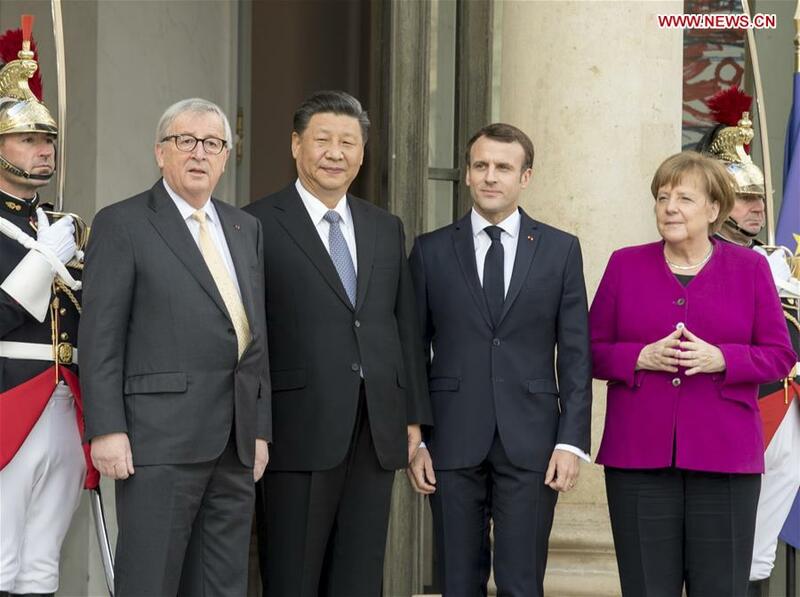 Stressing that China and Europe share far more common interests than differences, the Chinese president urged both sides to take the lead in upholding peace, development and win-win cooperation, and make the cake of cooperation bigger. China stands ready to work with European countries to promote the development of China-Europe ties, he said. Speaking of their meeting, Macron said it has sent a positive signal to the international community that the EU and China firmly uphold multilateralism. Meanwhile, France and China have inked a joint statement on jointly safeguarding multilateralism and improving global governance, which fully demonstrates the strategic nature of their cooperation, Macron said. France and the EU are willing to further enhance mutual trust with China, and together shoulder the historic responsibility of promoting world peace, security and development, he said. Noting that the world today is faced with many difficult problems regarding peace and development, Merkel underlined China's success and huge achievements in lifting hundreds of millions of people out of poverty. Germany attaches importance to China's key role in international affairs, highly appreciates China's support for Europe's prosperity, and is willing to work with China to advance the process of multilateralism, she said. Juncker said the EU and China, as cooperation partners, could do great things together for the world. The EU stands ready to accelerate cooperation with China and play a positive role in jointly addressing global challenges, he said.